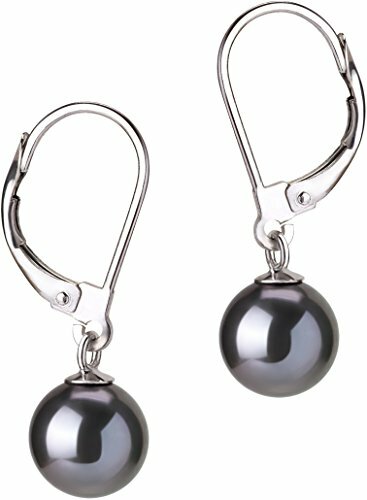 These lustrous black pearl earrings are an elegant gift for a special loved one or an excellent indulgence. This earring set showcases black freshwater 7.0 to 7.5mm cultured pearls and is an overall AAAA quality - combining amazing mirror-like AAAA luster, perfect (and very rare) AAAA shape and AAAA body. The easy-open 14 carat white gold clasp stays shut until you open it, keeping these earrings safe and secure where they belong. The deep and mysterious black color compliments any outfit, and lets you take advantage of the most recent trends in quality pearl jewelry. Your earring set will be carefully packed and shipped to you in an elegant jewelry box and pouch. If you choose, we would be delighted to gift wrap your purchase and turn this earring set into an unforgettable gift.